This beautiful sunset and seascape scenery was captured along the coastline of Hudson Bay near Churchill Manitoba. This area is mostly famous for its population of polar bears, but due its winter sunsets are simply beautiful. This beautiful sunset seascape picture was captured along the rocky shores of Hudson Bay in Churchill, Manitoba and shows the stunning scenery which is common place in this part of Canada. 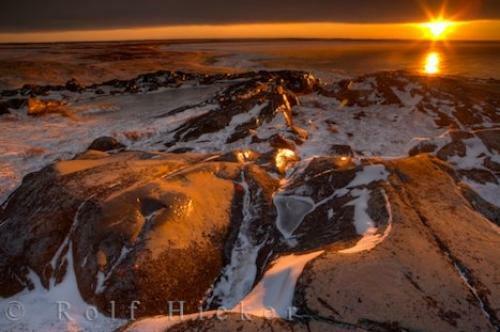 The icy rocks that line the shores of Hudson Bay glimmer in the stunning orange glow of sunset. Once winter sets in and the bay freezes along its perimeter this area can seem like a hostile, unforgiving place, however, some of the most amazing natural events can happen here. From a beautiful sunset in the late afternoon to the dancing lights of the aurora borealis at night. During the day when the sun shines a spectacular seascape and the coastal scenery of Hudson Bay are revealed. Picture of beautiful sunset scenery and seascape of Hudson Bay, Churchill, Manitoba, Canada. ... Hudson Bay itself however is huge, and not only has shores in Manitoba, but also Quebec, Ontario and Nunavut. Sunset over the rocky coastline of Hudson Bay, Churchill, Manitoba, Canada. I photographed this photo with the digital SLR camera model Canon EOS-1Ds Mark II, aperture of f/16.0, exposure time of sec. on ISO 50, as always I used a original Canon Lens, the focus lenght for this picture was 25mm.